Your days here can be as action-packed or as chilled as you want them to be. Welcome to the biggest fresh water aquarium on earth. There are no currents, no surges, just hundreds of cichlids all around you. The rock formations are quite spectacular and are home to so many endemic fish. All divers must be qualified. $75 per dive. We usually snorkel at one of the 7 islands in front of Lake Shore. There are literally hundreds of different species of cichlids in Lake Tanganyika and we are lucky enough to have one very special endemic cichlid, the Opthalmotilapia Boops (known as the blue neon by hobbyists) at one of the islands. This cichlid is found only in our area. Adults $40 and children under 12 years of age $5. What an awesome way to explore the Lake. We have double and single kayaks which are very stable and easy to use even for novice kayakers. Hop on and spend a few hours or join us for a kayak safari. Please see our Adventure Safaris page for more details of these trips. Daily price $35 per kayak. The perfect way to end off a magical day. Join us for a trip up the river to do some birding and then a cruise around the islands to watch the sun slip behind the Congo mountains and return back to the lodge for dinner. $35 per adult and $5 per child under 12. Right in front of Lake Shore we have Tanganyika Tiger fish who have made our bay their home. You can fish straight from our beach but please be sure to tag and release them once you have lured them onto your line. Just a short walk from Lake Shore is the old Kipili Mission built by the White Fathers and Congolese slaves between 1890 and 1895. This is one of the oldest churches in Tanzania and is well worth a visit. 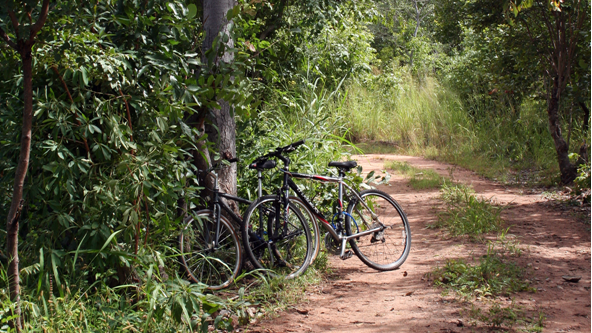 Cycle on gravel tracks past rural farms and through miombo woodlands. This is a lovely way to see the areas around Lake Shore Lodge. $15 mountain bike hire for a half day. We are surrounded by natural beauty, we think it's pretty cool - and so do the birds. We have compiled a small bird list for those who enjoy the finer things in life!